By the time we arrive for the Monday morning performance, St. Louis Symphony violinist Hiroko Yoshida has already made her way to the Infusion Room to warm up. Yoshida has performed in the Saint Louis University Cancer Center so often that she feels at home there, both with the patients and the staff. Fellow violinist Silvian Iticovici joins her in the informal space adjacent to the Infusion Room. They take another look at their music, close the door and practice together for a short while. The Infusion Room consists of a number of large, plush lounge chairs with IV stands and monitors nearby. Patients, some alone, some with companions, sit in the chairs and wait. This is where they come for their cancer treatment. I watch a nurse settle beside a patient and carefully hook the IV to his arm. They chat casually together. “It’s fascinating to watch a good nurse at work,” Crystal Weaver says to me. 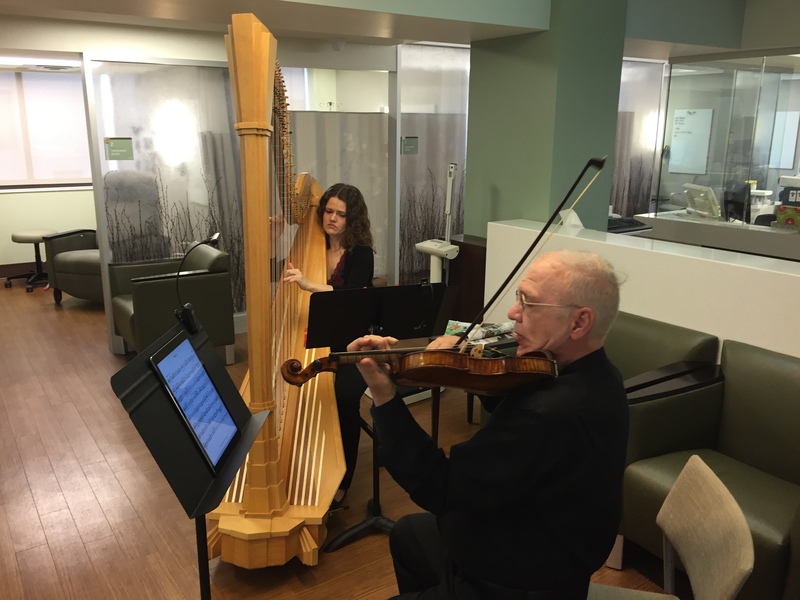 Silvian Iticovici & Hiroko Yoshida perform in the Infusion Room at the SLU Cancer Center. Weaver is a music therapist at SLU Cancer Center. She and the Cancer Center have partnered with the St. Louis Symphony and its SymphonyCares program, under the direction of Maureen Byrne, for five years now. 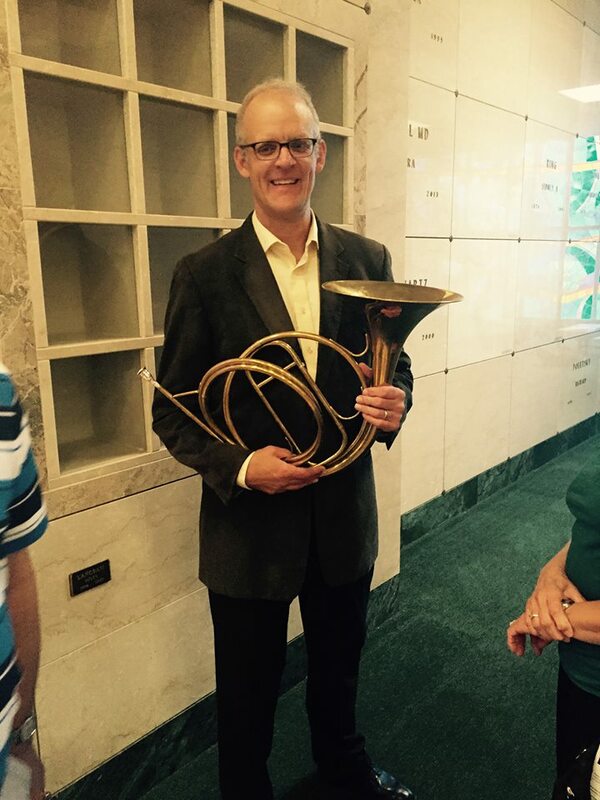 It’s been a very close partnership, and Weaver and her colleague Andrew Dwiggins have gotten to know many of the Symphony musicians, their needs and idiosyncracies, their care and commitment. They knew Yoshida would be early and Dwiggins was prepared with chairs and music stands. 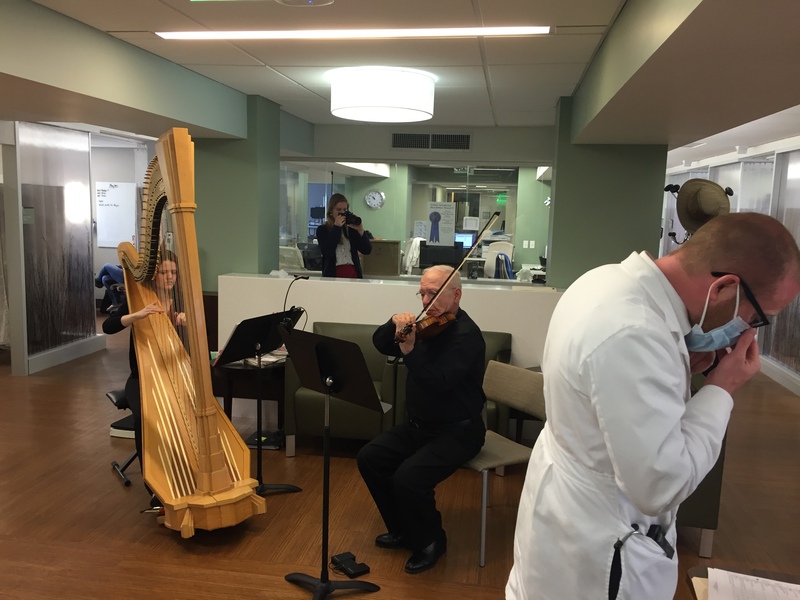 Over the years, with Weaver giving an orientation for musicians each fall, the Cancer Center concerts have become one of the most popular community programs among STL Symphony musicians. Dwiggins gives a brief introduction, telling the patients that he hopes the music will make the time pass more easily. One woman gives a thumb’s up as soon as Iticovici and Yoshida begin to play. Some people settle back a little more deeply into their chairs. One woman sits forward in her seat, leaning toward the music to take it all in. 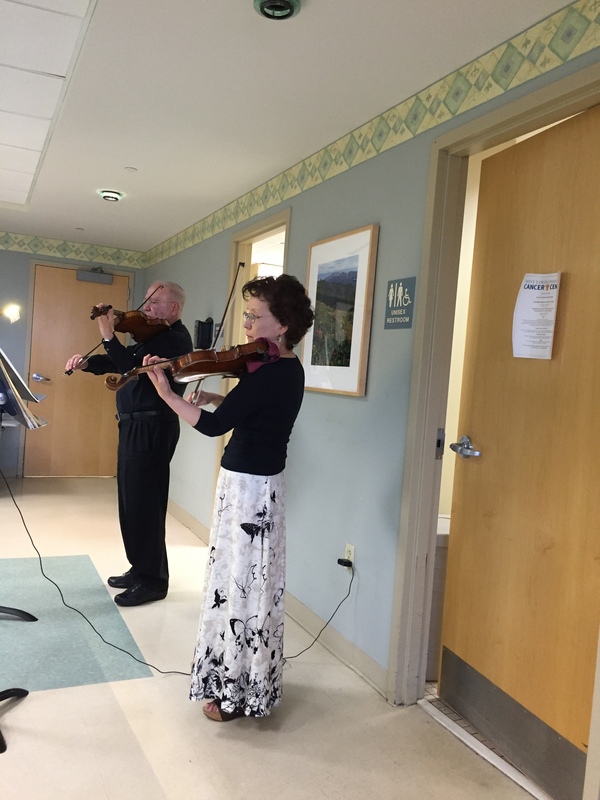 During the duets–Gluck, Tchaikovsky, Chopin, Bach, Brahms, Corelli–the work of the hospital never stops. Nurses welcome patients and prepare their IVs. When one patient is done, he mutters “I’d like to hear that more often,” as he heads out the door. Faces that had appeared to be troubled, perplexed, anxious–in a few minutes become relaxed and settle into calm and smiles. Iticovici and Yoshida end with a familiar lullaby. And then just one more piece. “An encore,” Iticovici grins. 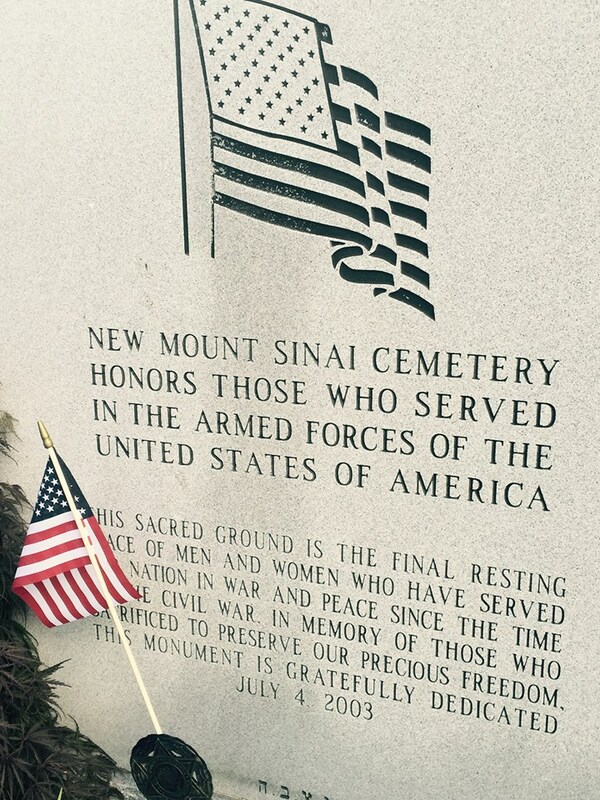 Memorial Day gives us mental and emotional time and space to remember those we’ve lost in war. The SymphonyCares program has been adding music to that time and space at New Mt. Sinai Cemetery for three seasons. Associate Principal Horn Thomas Jöstlein, pianist Patti Wolf and tenor Daniel Brodsky performed works by Berlioz, Chabrier, Ravel and contemporary composer Anthony Plog. Brodsky is Executive Director of New Mt. Sinai along with being a longtime member of the St. Louis Symphony Chorus. Director of Community Programs Maureen Byrne told me “The concert program always shows respect for the occasion, but it’s never overly solemn.” Remembrance should be joyful too. Maureen Byrne and Gary Godwin. 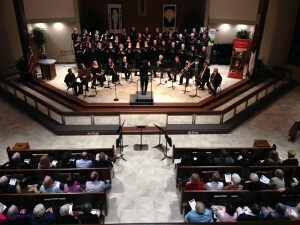 Godwin’s Silk Foundation helps support community programs concerts such as SymphonyCares @ New Mt. Sinai Cemetery. Barbara Fletcher sits in her hospital room chair with blood flowing into her body through a tube. “My kangaroo juice,” she calls it, because whenever she receives new blood she feels new energy. A short concert has just concluded outside her room, performed by Symphony violinist Silvian Iticovici and Principal Harp Allegra Lilly. Fletcher describes the images that passed through her mind as Iticovici and Lilly played works by Satie and others. Fletcher tells me about warm breezes, trees, a refreshing pond with fish rising briefly to the surface. 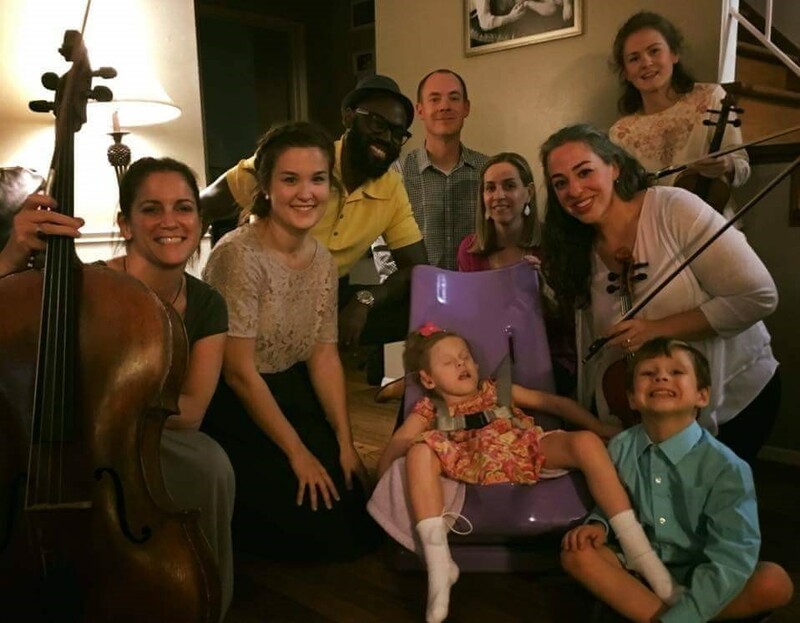 The music took her far outside the hospital room, far from the tubes and monitors. 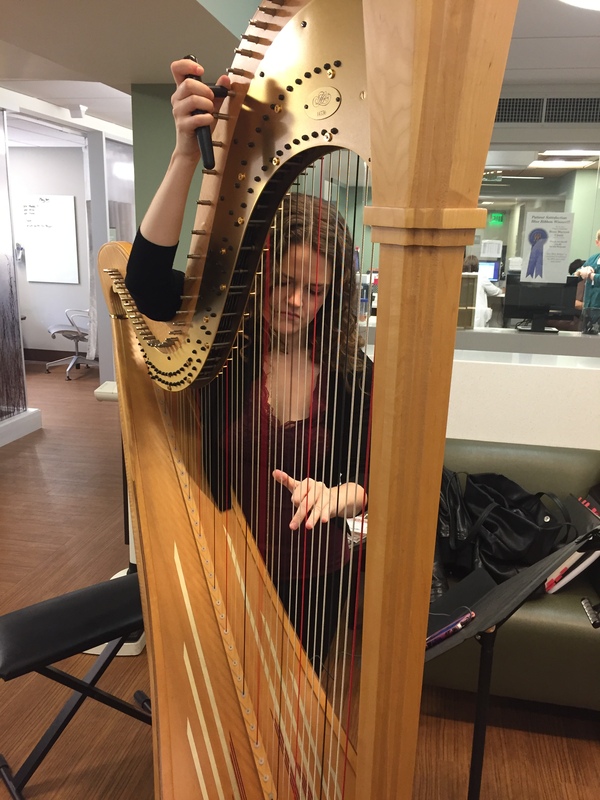 Allegra Lilly tunes at SLU Cancer Center’s Blood & Marrow Outpatient Transplant facility. 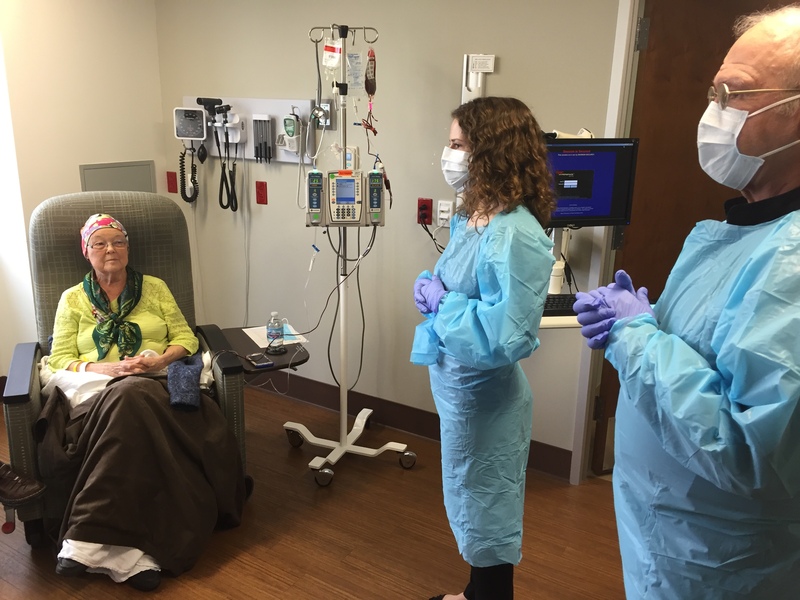 Fletcher visits the Blood & Marrow Outpatient Transplant services at Saint Louis University Cancer Center regularly with her husband and daughter. Her daughter was her marrow donor. 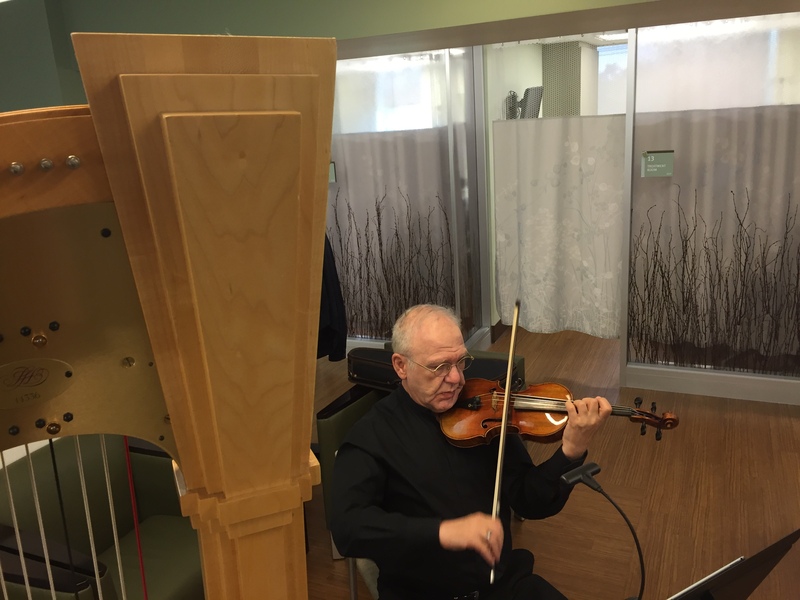 Nobody likes to come for cancer treatment, but when Symphony musicians are scheduled to perform it becomes a day to look forward to. 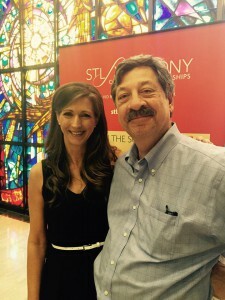 SymphonyCares and the SLU Cancer Center have been partnering since 2011. Maureen Byrne, Symphony Director of Community Programs, never has a hard time finding musicians to participate. On a drizzly Monday morning, Lilly and Iticovici set up in front of a nurses’ station. The doors to the patients’ rooms up and down the corridor are open. Without introduction, the music begins. A doctor dons a mask before entering a patient’s room. Video intern Nicola Muscroft documents the concert. 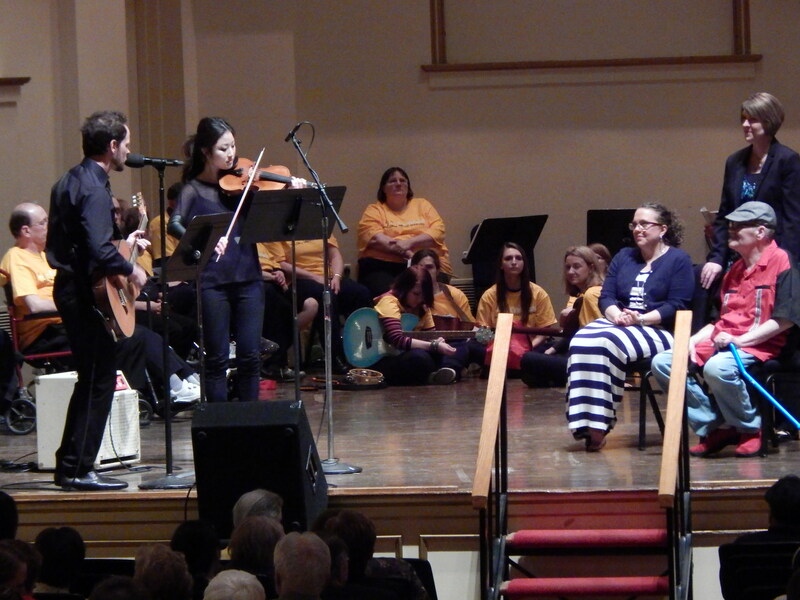 Music therapists Crystal Weaver and Andrew Dwiggins are on hand for whatever may be needed. Weaver tells me that it’s not expected for the Symphony musicians to be therapists, but she and Dwiggins have the training to come to a patient’s or a family member’s aid when the music pulls the emotions intensely. Dwiggins says it’s never a matter of being alarmed that someone may cry, but to make sure that the patient or loved one feels safe to cry, to acknowledge what the music has released. Allegra Lilly and Silvian Iticovici meet with Barbara Fletcher and her family. The St. Louis Symphony gets around. 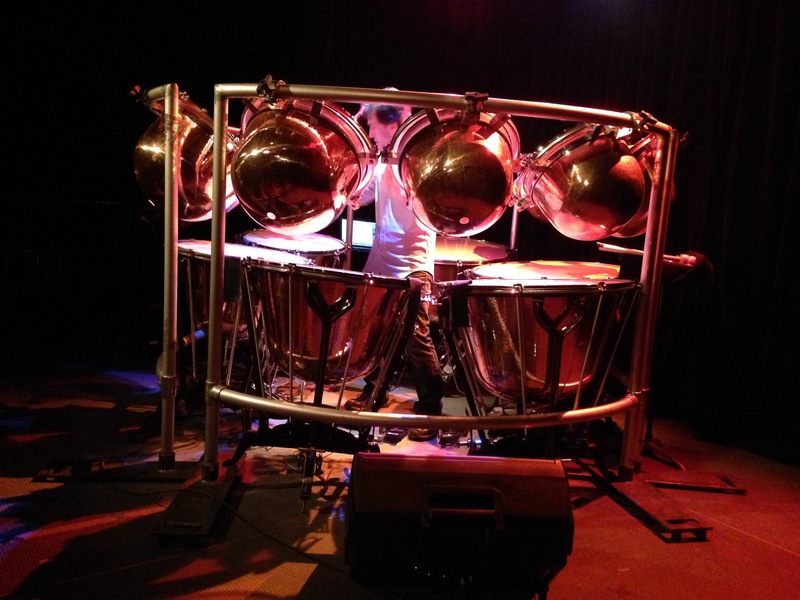 Monday night Principal Timpani Shannon Wood gave a solo preview of Kraft’s Timpani Concerto No. 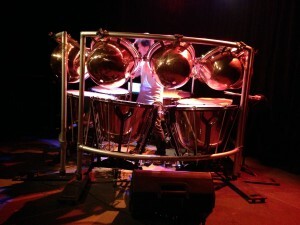 2, “The Grand Encounter,” at the Kranzberg Center for the Arts as part of Symphony In The City. 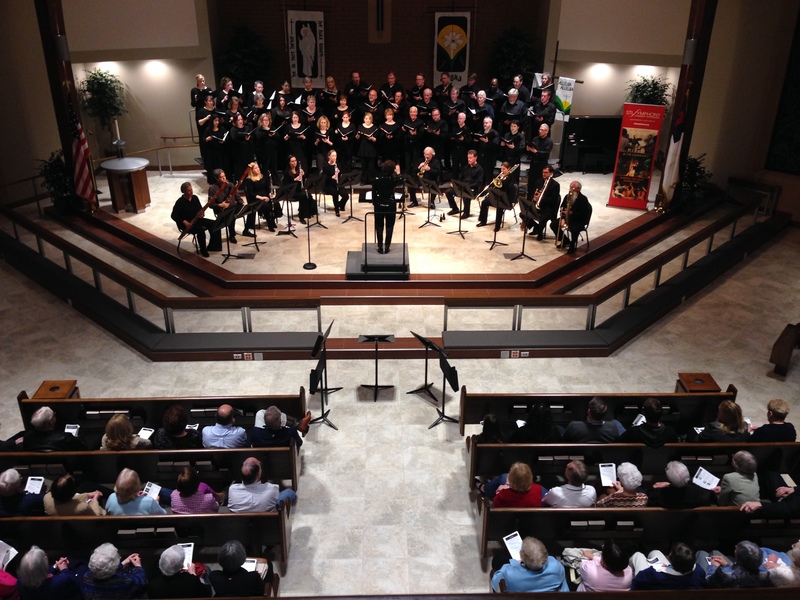 Last Sunday night members of the St. Louis Symphony Chorus, a wind ensemble from the St. Louis Symphony and Amy Kaiser performed Stravinsky’s Mass at Peace Lutheran Church as part of Symphony Where You Worship. 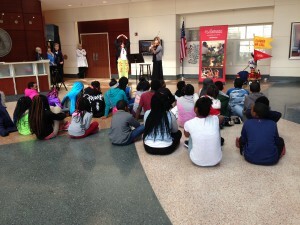 Last Thursday Claire “The Clown” Wedemeyer of Clowns on Call and Symphony First Violinist Angie Smart demonstrated how music mixed with comedy helps children heal at the Goldfarb School of Nursing, with students from Cote Brilliante Elementary looking on as part of a combined Symphony In Your College and SymphonyCares program. 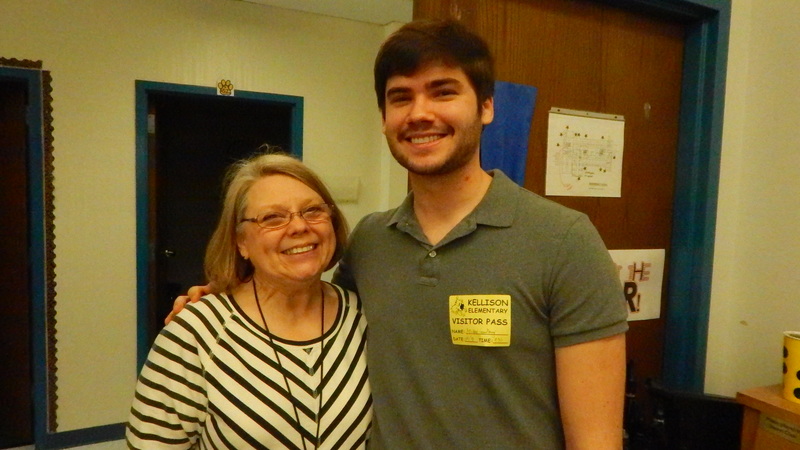 Michael Gandlmayr of the Symphony Education Team visited Kellison Elementary today (Wednesday morning) to view classes preparing for the Link Up concerts on May 11. 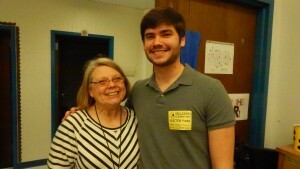 Michael is an alum of the Rockwood School District and ran into his first violin teacher, Darlene Lanser. 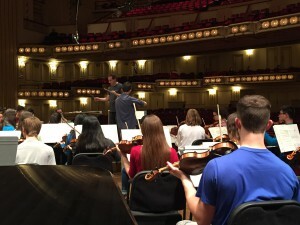 St. Louis Symphony Youth Orchestra rehearsal on the Powell Hall stage. Aidan Ip is a YO Concerto Competition Co-Winner rehearsing Conus’s Violin Concerto in E minor with the orchestra on Saturday afternoon. Leah Piepert, the other Co-Winner, will be performing Hüe’s Fantaisie for Flute and Orchestra in the same YO concert, Friday, March 18, 8:00pm. Free! 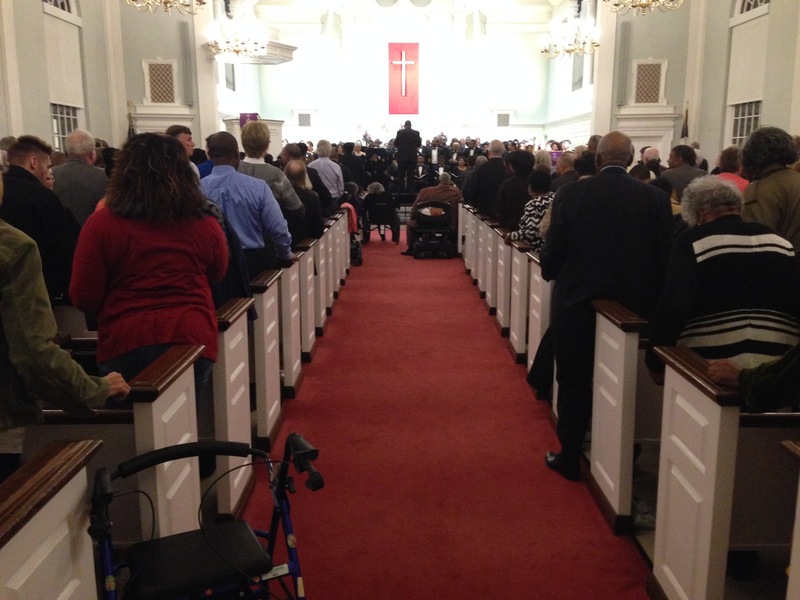 On Sunday evening, February 28, the entire congregation at Salem United Methodist Church rose to its feet to sing “Lift Every Voice and Sing.” The St. Louis Symphony IN UNISON Chorus, under the leadership of Kevin McBeth, was also joined by Associate Principal Clarinet Diana Haskell for “Amazing Grace” in this Symphony Where You Worship concert. 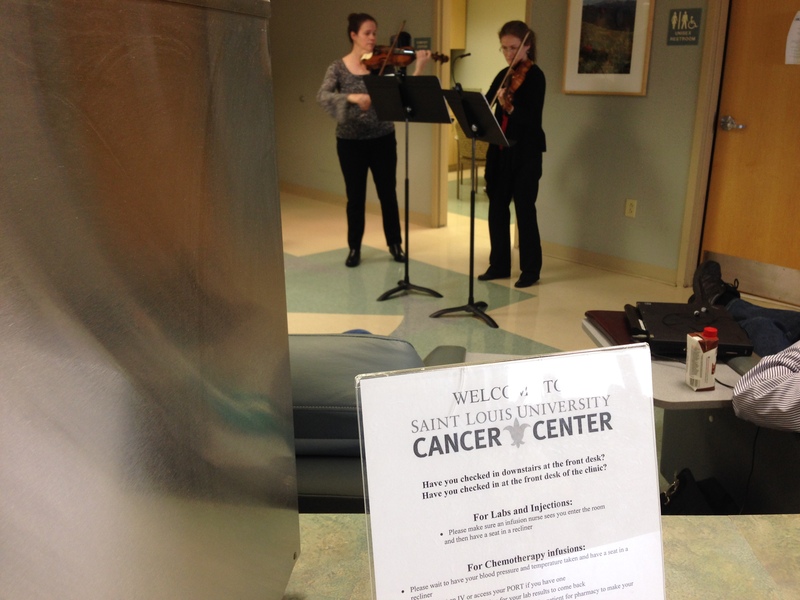 Monday morning, February 29, Symphony violinists Kristin Ahlstrom and Eva Kozma performed in the infusion room at SLU Cancer Center, making a number of patients’ chemo treatments much less stressful. 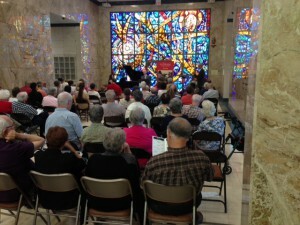 Patients actually schedule their treatments so they can take in a concert, part of the SymphonyCares program. 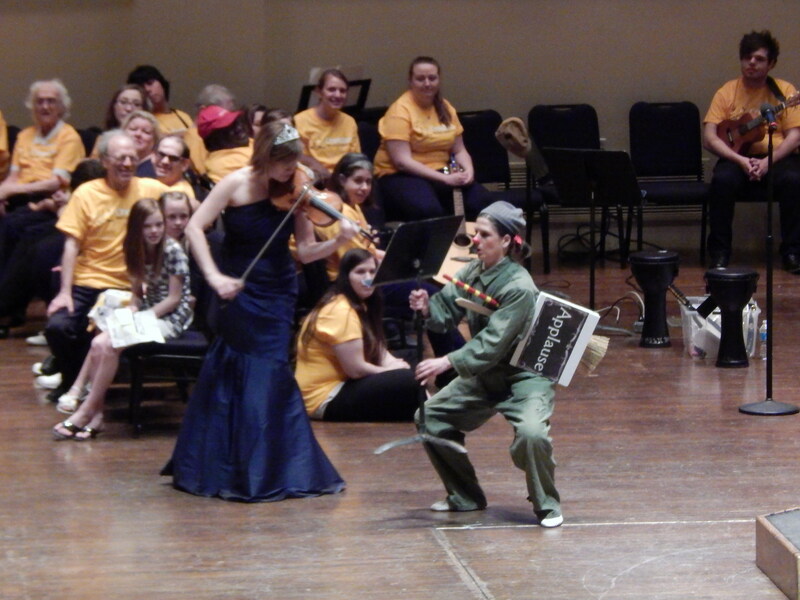 Claire “The Clown” Wedemeyer and Symphony violinist Angie Smart are in the business of smiles and laughter. 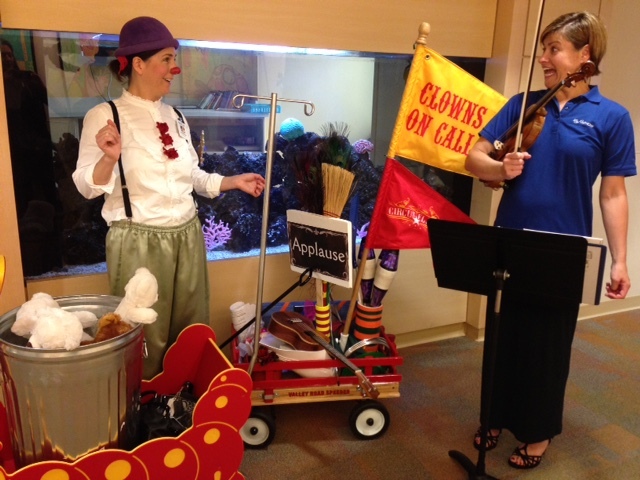 Through Clowns on Call and SymphonyCares they visited Mercy Children’s Hospital this week and lifted spirits from room to room. A little shtick goes a long way to making children and their families feel a little bit better. 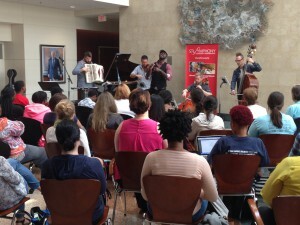 Last Thursday morning, the 442s–Shawn Weil and Bjorn Ranheim from the Symphony and Adam Maness and Syd Rodway from the Erin Bode Group–and recording artist Brian Owens, who is also the Symphony’s IN UNISON Artist-in-Residence, played a concert at the Goldfarb School of Nursing. 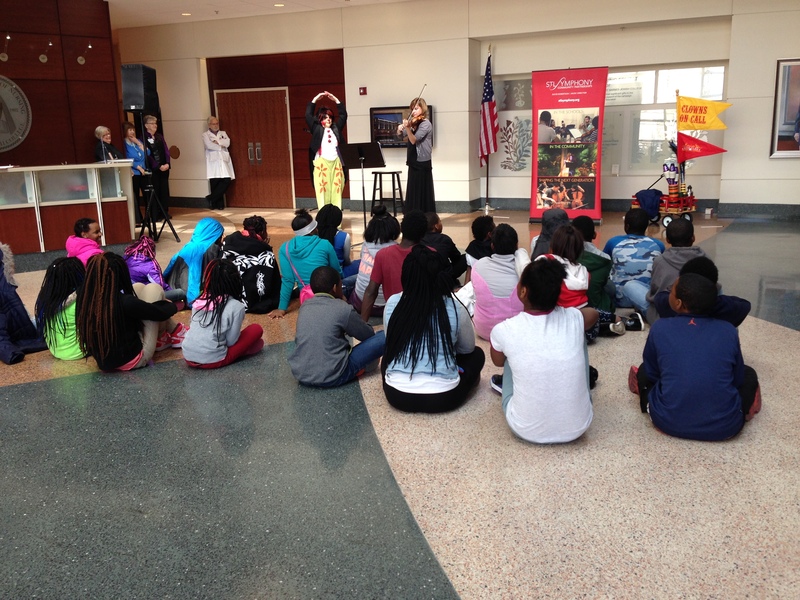 Goldfarb is one of our partners in the SymphonyCares program and provides an enthusiastic audience of nursing students whenever musicians from the Symphony perform there. 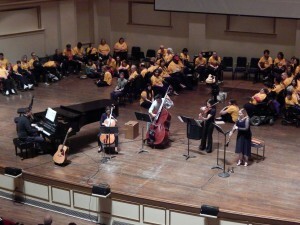 Along with the nursing students in attendance, orchestra students from Ferguson Middle School came to the show as well. 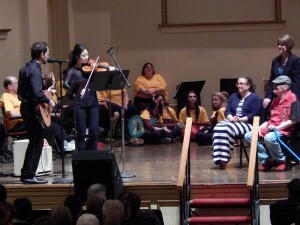 Grace Fitter, Director of Orchestras at Ferguson Middle School, saw the concert as an opportunity for her students to realize that continuing education is accessible and possible for each one of them. 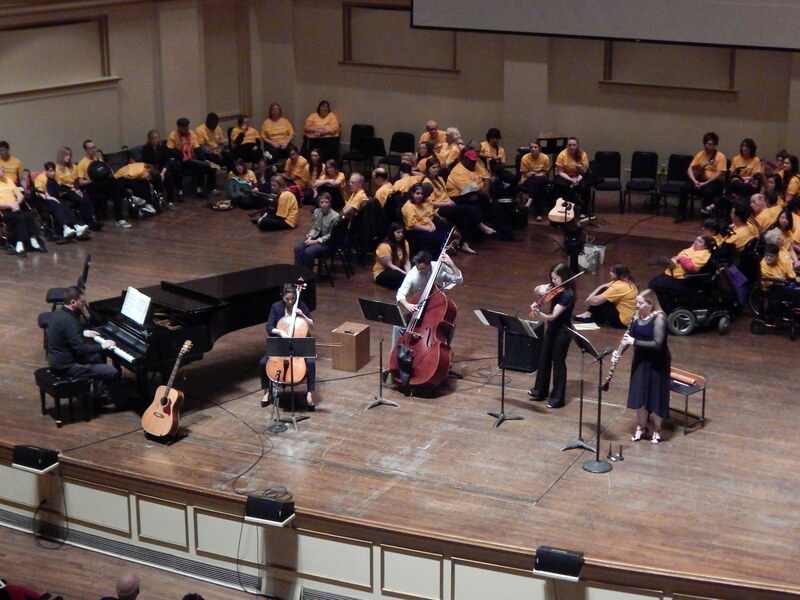 Wednesday night at Powell Hall, the SymphonyCares Showcase presented many of the inspiring activities the St. Louis Symphony musicians are involved in, taking their music to those who need it the most. The Showcase also placed on center stage its essential partners, those with the medical knowledge to know what works best and what truly makes a difference in the well-being of their patients. 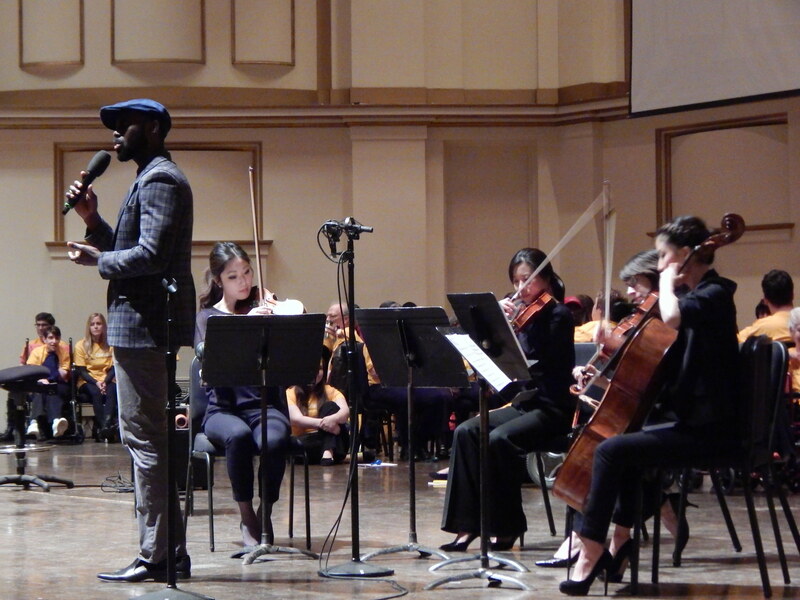 The Heart Quartet, with vocalist Brian Owens and guest violinist and cardiac surgeon Dr. Dawn Hui of Saint Louis University Hospital, performed arrangements by Adam Maness, including heart-warming renditions of “Sometimes I Feel Like a Motherless Child” and “Amazing Grace.” The Heart Quartet played at IN UNISON churches and other venues throughout the region in February, bringing music and information about women’s heart health. SymphonyCares became the principal entertainment for a bone-marrow-transplant birthday party at SLU Cancer Center this season. As the Cancer Center’s Crystal Weaver explained, when a patient receives BMT, it is a kind of rebirth, and so a birthday party is given. BMT recipient Clifford Burnett was asked if he had one song he’d like to hear for his party. He chose Van Morrison’s “Into the Mystic.” In the Cancer Center, the piece was performed by Principal Harp Allegra Lilly and First Violin Ann Fink. 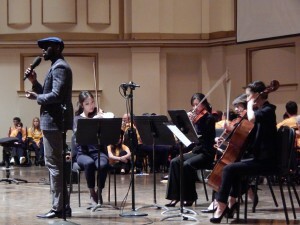 At Powell Hall, Clifford and his wife Deanna and the Showcase audience heard the Van the Man song played by Andrew Duggins on guitar and the Symphony’s Melody Lee on violin. Cortango Orquesta, with a core ensemble of Symphony musicians Cally Banham, Asako Kuboki and David DeRiso, have been enlivening the local dance scene for a couple years now. 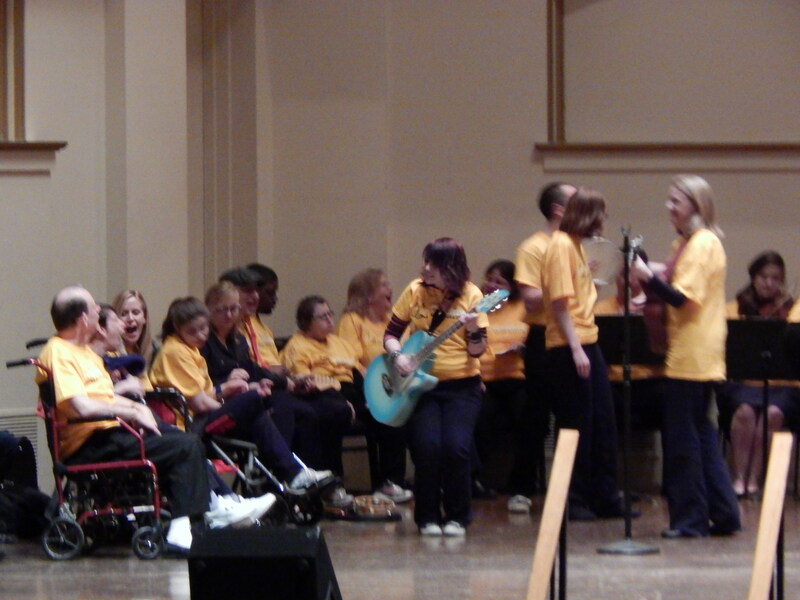 They also have been playing in the SymphonyCares program. Wednesday night, Dr. Gammon Earhart, of the Washington University School of Medicine, talked about the remarkable improvement Parkinson patients experience when combining regular movement therapy with tango dancing. Live tango music makes it even better. The Symphony, the Maryville University Music Therapy program, and the St. Louis Arc have been partnering for a number of years now. The culmination of the season for all partners is the SymphonyCares Showcase, with a variety show that features music, jokes and some wild skits. It’s always a joyful finale to the program. Any SymphonyCares Showcase is not complete without a performance by St. Louis Symphony violinist Angie Smart and Claire “The Clown” Wedemeyer of Circus Flora’s Clowns on Call. A hospital-room visit from Angie and Claire have left children laughing in their hospital beds for a few years now. Angie and Claire are constantly coming up with new routines, new pratfalls, new uproarious absurdities. The Showcase always ends with laughter mixed with tears. Thanks to all the Symphony musicians and partners, and to Director of Community Programs Maureen Byrne. How do you make St. Louis a better place? Stick with these folks.